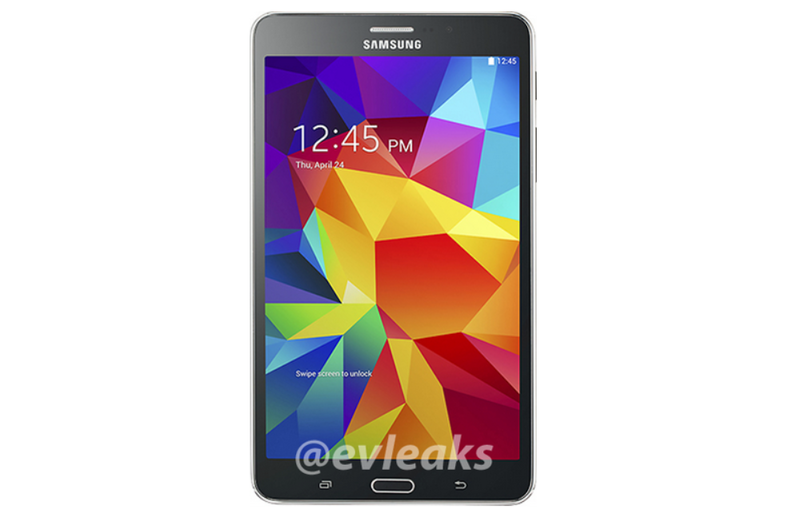 With all the fervor surrounding the Galaxy S5, it’s easy to forget Samsung has product upon product in the pipeline, one of which is the Galaxy Tab 4 7.0. Today, we have some news on that from in the form of a leaked renders, courtesy of @evleaks, which showed a restyled tablet more in line with the Galaxy S5’s design. The device renders are of the white and black Tab 4 7.0 model. Notable changes include the replacement of the menu button found on previous Galaxy Tabs with a multitasking button. The tablet also appears more rectangular in shape, reflecting the Galaxy S5’s refinements. Hardware rumors suggest all Tab 4 models will sport a WXGA (1280×800) display and an unknown 1.2 GHz quad-core processor. The 7-inch Tab is decidedly low-end, with reportedly only 1GB of RAM compared to 1.5GB for the 10.1-inch variant, a 4,450mAh battery (the 8- and 10-inch pack a 6,800mAh battery), and 8GB of storage. Still, it might be a good budget buy. Samsung inadvertently revealed the refreshed line of Galaxy Tabs on its promo page for the Gear Fit. If the information proves accurate, we should see a Tab 4 8.0 and 10.1 alongside the 7.0 when it eventually launches. Anyone excited for the new Tabs?